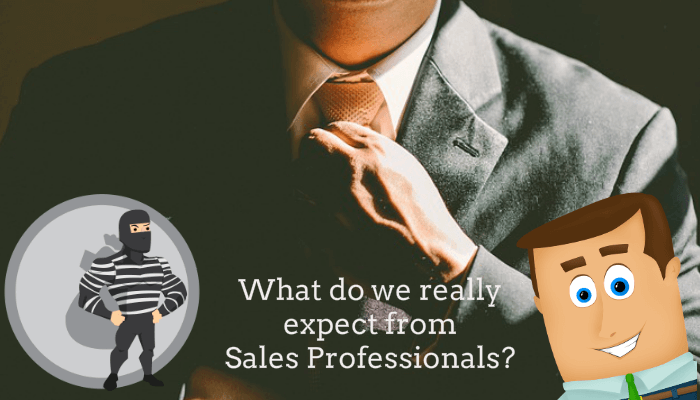 In this article, I’ll discuss about 2 profound aspects of what we expect to find in sales professional… mostly as clients. 1) Can I trust him/her? 2) Now, do I trust him/her? I know it sounds the same … but not exactly. Of course, it’s all about “MY ISSUE”, “MY PROBLEM”! And I want solutions that fit my problem, within my restrictions. I want my best interest to be taken in consideration. "Does this sales person able to take my best interest as a priority, and make it as a guideline?" And this can be called INTEGRITY, defined as (from a client's perspective): “My Best Interest” does not enter into competition with some cheap considerations – I say “cheap”, because for me, things like your internal sales targets, internal sales contest... will sound like cheap considerations. So INTEGRITY is the 1st point. But to be honest, for me, as a client, it’s often very difficult to judge the level of INTEGRITY of the sales professional, unless he’s proposing me something that obviously does not match my MBI. So, the second point is … TRUST. Yes, that’s obvious. You’ve guessed it by the 2 questions from the beginning of this article. Well, I can trust or distrust somebody because I know him/her. If I know him/her, that means there is an anteriority of a common history. An anteriority of a common history simply means or defines our relationship. So, mostly, trust can only be built on a relationship. The relationship can be real, we physically already met, talk, or the relationship can be more virtual, like online presence, or a friend I trust for his/her wise judgment trusts you. If we have no anteriority of a common history, then we have no relationship. The sales professional will have to build one. “Can I and do I trust you?” is somewhat subjective. It’s subjective to many things you don’t control, maybe even to my current mood. From the company’s perspective of “what do we expect from sales people?”, “INTEGRITY” and “TRUST” are also very important, if not essential. Definitions and subtleties in definitions and implications may differ from the client’s perspective. It may differ because a company also needs to live, to be sustainable, is in a specific industry … and then “INTEGRITY and TRUST” can be divided in specific mind traits, attributes and skills. it is possible to objectively evaluate those mind abilities. I will be glad to read your comments, thoughts coming from your personal or company’s perspective. Xavier helps companies and inviduals to identify and measure specific behaviors, mind abilities and values.